Description: The Wood Chip train returns to St Albans. Description: The Chip Train is seen returning to St Albans Yard. Description: NECR roundhouse in St. Albans, Vermont. 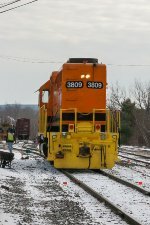 At left is GP40CU 3809 and, to the right, is GP38 3845, which just exited the roundhouse after being inspected/repaired following a minor derailment in the St. Albans yard the previous week.